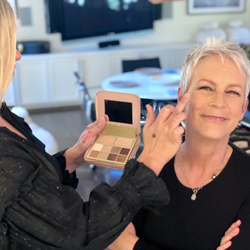 b-glowing is pleased to announce that makeup artist Camille Clark has used the b-glowing BEAUTY™ Illuminate + Shine™ Palette on her client Jamie Lee Curtis, who is the embodiment of what we believe the Age Embracing™ Beauty Revolution is all about. Ms. Clark used the clean and non-toxic eye palette to highlight Ms. Curtis’s incredible natural beauty. We are not only fans of Ms. Curtis’s tremendous acting career, but also of her work as an advocate against ageism, for body acceptance and empowerment of women of all ages. We are thrilled to receive the support of our vision from women we admire and who inspire us. The breakdown of how Ms. Curtis used the b-glowing BEAUTY™ Illuminate + Shine™ Palette is below. At b-glowing BEAUTY™ we create products for mature women that celebrate our journey. Products that highlight—not hide—our unique beauty. Women deserve luxurious formulations that celebrate our age with colors developed specifically for our changing beauty needs. At b-glowing BEAUTY™, we are committed to making fabulous makeup that works without apologies for the second half of our lives—we deserve it! With that in mind, we’re developing more products that we look forward to sharing with you this summer (stay tuned!). The b-glowing BEAUTY™ Illuminate + Shine™ Palette is clean, non-toxic, and free from harmful chemicals and additives. This rule-breaking, Age Embracing™ palette is filled with 10 products: a brightening primer, highlighter, and eight pigment-packed shadows. The palette allows you to experiment with shades that brighten, blur, illuminate, smooth fine lines, and nourish skin. From its innovative ingredients to the com-plementary colors, everything is designed with aging skin in mind to brighten, lift and enhance eyes and improve the health of your skin. All b-glowing BEAUTY formulas are infused with MicroVector Plump GABA-HYA—a moisture-rich blend of collagen, hyaluronic acid, and other ingredients that help plump, hydrate and smooth the skin. Recreate Jamie Lee Curtis’s look with the following steps and tips from makeup artist Camille Clark who chose this palette for its velvety smooth texture and beautiful range of shades and pigments with the per-fect amount of shimmer. 1. I started with the Brighten + Perfect Cream Base on the eyelid. 2. I used Silhouette (warm matte taupe) in the crease of the eye. 3. For a soft smokey effect, I mixed Rococo (antique metallic gold) and Baroque (deep metallic plum) in the outer corners of the eye. 4. I applied a soft touch of the Inner Glow Cream Highlighter on her cheekbones to complete the look. Curating Beauty Since 2004. Now in its 14th year, b-glowing.com features more than 150 brands and has been recognized industry wide for its extraordinary collection of hard-to-find niche beauty products along-side some of the world’s most coveted beauty brands. The company’s success is due in part to founder Lisa King’s discriminating buying taste and ability to discover progressive brands for her loyal customers. The b-glowing.com shopping experience includes a knowledgeable Beauty Concierge, brand exclusives, worldwide shipping, free domestic shipping on orders $75+, hassle-free returns, and three free luxury samples with each order. For additional information, please visit http://www.b-glowing.com.